2. Fry the cumin and coconut in ghee and keep aside. 3. 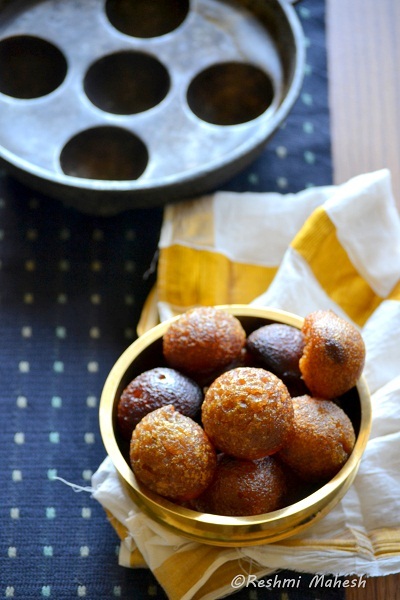 Add the chakkavaratti to rice flour along with cooled jaggery syrup and fried coconut, cumin. 4. Mix with required amount of water such that the batter should be thick almost like idli batter or little less. 5. Heat the appam pan(kaarolu), Pour oil(as needed to deep fry) in to it.once hot, pour the batter in to it and wait till it turns golden brown.NowTurn it with a stick and cook the other side. 6. Remove it on a kitchen tissue.Continue the process. 7. Enjoy it warm or at normal temperature.These remain good for more than a week. 1. Soak 1 cup of raw rice in water for 3 to 4 hrs. Drain and spread on a sheet of paper/cloth. 2. When it is partially dry,grind it to a not too smooth, but little grainy powder.Use this to make appams. 1. Usually rice flour is not fried to make unni appams. 2. Add jaggery as needed. This looks so delicious. And all so perfectly brown and uniform shapes.Wow! A new recipe for me..Unni appams looks so cute and delicious..
Unniappams with Jackfruit sounds so yummy n it looks too tempting!! 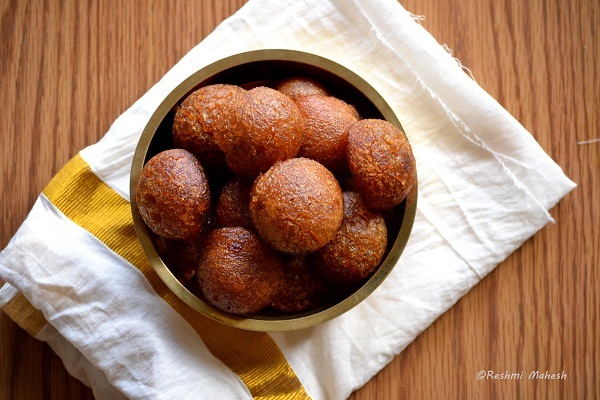 Adipoli unniappam.love the presentation and the clicks,drooling. Yummy and lovely looking appam. those unni appams look gorgeous! looks so tempting, nice authentic presentation! Nice and delightful appam !! 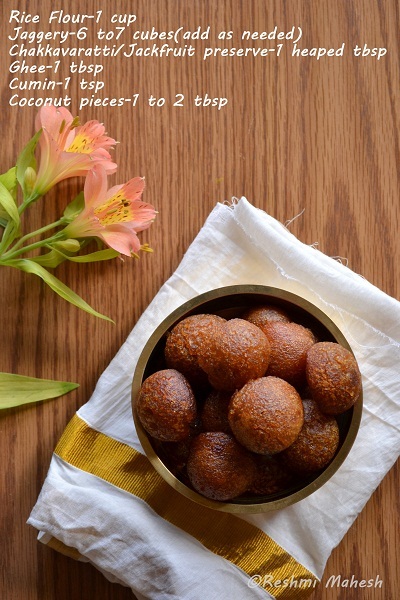 Wat an inviting and droolworthy unni appams. Reshmi, this truly looks mouth-watering. I loved this. South Indian food is such a variety! Such an awesome snack. I love it. These looks so delicious,feel like grabbing one. Interesting recipe, looks so yummy. my all time favorites...it looks so so delicious dear...drooling over the pics !!! !